This table was built to be auctioned off at a local charity fundraiser to benefit the mentally and physically handicapped. It is built to the same dimensions as the Eco Sofa Table but I made some design element changes. The most obvious difference is that I dyed the bamboo red. Second, I made solid panels instead of slats and I really like this look. I used red dye on the bamboo and the frame is poplar. I used black dye on the poplar and then sprayed black lacquer on it. This builds the color fast with minimal fill of the wood pores because I want to keep the texture of the wood, I did not want it to look like plastic. On a black surface the texture is subtle but visible. This is important to me because I am mindful of the color and textural contrasts when making a piece. This element increases the visual interest that many projects lack and it is one of the keys to creating what I would consider a sophisticated design. The dyes are from Sherwin Williams and they are universal just like the Transtint Dyes or any other dyes that woodworkers tend to buy. At Sherwin I pay $90 for a quart (32 oz.) which is a lot more cost effective than $17.50 for a 2 oz. bottle from a woodworking supply store. I used MLCampbell Magna Max pre-catalyzed lacquer as the finish. It is rated for kitchen and bath cabinets but it is catalyzed at the store and so I do not have to mess with mixing it myself. I have not used it enough to determine if it is really better for wear than Sherwin Williams pre-cat lacquers but it is a comparable and competitive product as far as application goes. It has a 3 month pot life and no more, you will start getting the crystallization particles in it at that point. I used the Festool Domino for the joinery and it is perfectly suitable for a table of this size and intended use. 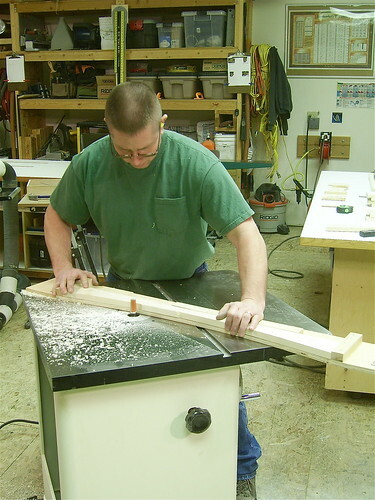 It provided me with a rapid and accurate means of joinery. I could not have cut M&T as fast as I punched holes with the Domino. I used templates for the arches. This allows me to create the pieces repeatedly with accuracy and speed. 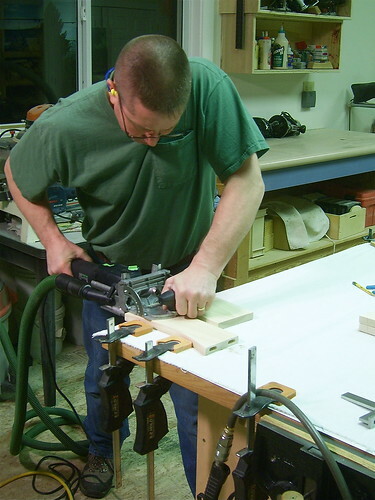 I use the template to draw a line and then I cut close to it using the bandsaw. Then I place the piece in the template and use a bearing guided bit in the shaper. The top and bottom shelf have bamboo veneer on plywood with a solid poplar frame. The side panels are bamboo veneer on 1/4” MDF because it remains flat compared to 1/4” plywood. I did not get any progress photos of the veneer work because of my schedule. I did have fun working with veneer again. It is a medium that I enjoy and the vacuum press is fascinating because of the projects that it allows me to create. I did not get photos of the entire process because of my schedule, but you may see the full set at my Flickr account. There is still quite a bit of visual information there and I hope it may help with your ideas. Tod this is very cool , I like the slight sweep to the legs they look great with the approns . Very very nice. Is there an inlay on the inside edge of the top frame pieces? Or maybe just a shadow line from an edge detail reflecting light? From the first 2 pics I thought you had an inlay strip in there but then the 3rd pic which shows it closer doesn’t seem to show one. Nice shop too BTW. Todd I saw them on Flicker last night. A great looking table. Todd, this is really great stuff. I see some Modern, some Krenov, some oriental and lot of good ol’ Todd. Great color as well. Love those gams!! “Good ol’ Todd” – Thanks Thos. that has to be one of my favorite compliments. Doug S – I created an accent V groove between the solid wood and the veneered panel. As things come together and age a bit, the joints tend to get fractures because the wood comes together at right angles. This is a method that hides it but the drawback is that it is a dust collector. The panel had a slight crown in it and any elevation difference is not seen. It is VERY minor but during glue up I could not achieve perfection. The real problem is that veneer does not allow me to sand it all down even. As of now any elevation difference is not perceived. beautiful work … black and red looks great together. a real piece of eye candy. Really beautiful piece. Great work Todd! Great work. I love your choice of finishes. Great little table Todd. Nice Finish! Sweet looking Sofa Table Todd!!! Sophisticated is an excellent description. Beautiful! Fantastic! great design and execution. Love it.